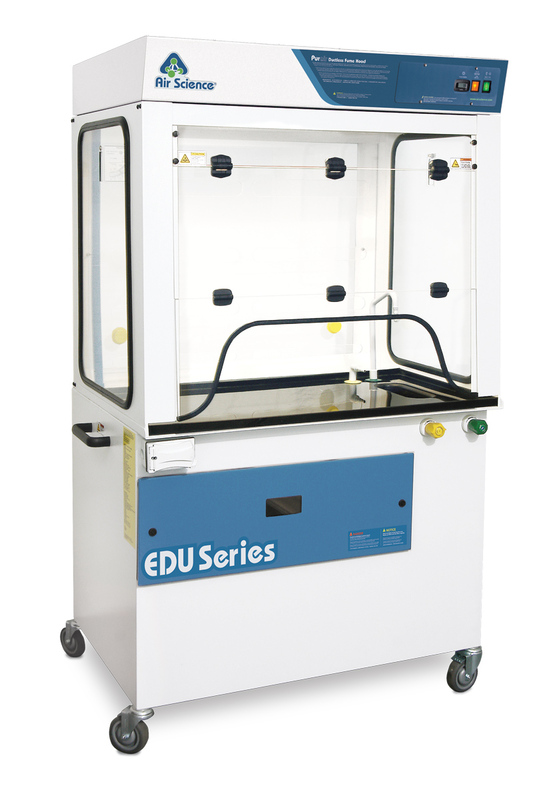 The EDU™ Series Ductless Demonstration Fume Hoods are designed to provide 360° visibility, while protecting users and the classroom environment from hazardous vapors generated on and above the work surface. The cabinet design assures efficient learning experiences in the classroom. Energy saving LED lighting and a high performance ebm-papst EC blower are specifically selected for the classroom application. Our single EC blower motor assures lower cost of ownership as well as long life and dependable performance, providing long term cost savings, so you can focus your energy on the classroom topic at hand. At the heart of the EDU Series product line is innovative filtration technology. The Multiplex™ Filtration System consists of a pre-filter, main activated carbon or HEPA/ULPA filter and safety activated carbon or HEPA/ULPA filter. The system permits a customized combination of filter media and configuration for chemical and physical adsorption specific to each application need. EDU Series products are available in 4 configurations and 6 standard sizes, in metal or polypropylene construction, totaling 12 standard models. View our EDU Series products and learn more about our energy saving features and benefits.